A good location with plenty of riding options, experienced Italian cycling guides, a comfortable hotel with very friendly and helpful staff, and last, but by no means least, fabulous local food. All in a package that provides unrivalled value for money. And it’s in Italy. A country and people that lift the spirits like no other. Triathletes can also add swimming and running sessions to their programme. For swimming you can choose between the Adriatic or Cesenatico’s large municipal swimming pool, just a five minute walk from the Riz. For running there’s the sandy beach, the promenade or local park. Saturday: Minibus from Bury to Stansted airport. Coach transfer from Local airport to the Hotel Riz. Saturday afternoon: Check the rental bikes that are waiting for us in the hotel garage and go for a short ride (stopping in at the local bike shop if any major modifications need to be done). Of course some members take their own bikes. Sunday through to Friday: At 9.30am meet the local guides who will lead the rides. There are usually three ability groups. A stop for coffee midway through the four or five hour ride and then it’s back to the hotel by mid afternoon for a pasta buffet and cakes, followed by whatever takes your fancy – a walk on the beach, a visit to the hotel’s gym/spa, a massage or a siesta before dinner at 7 o’clock; which is eagerly awaited by one and all. The food is fabulous and so is the local wine which is served on-tap. Saturday: A coach ride to the airport for the flight home. Minibus waiting for the return journey to Bury. Triathletes: Triathletes can also get their swimming and running sessions in as Cesenatico has a large municipal swimming pool just a five minute walk from the Riz. For running you can choose the sandy beach, the promenade or local park. Non-cyclists: Non-cycling partners are welcome and there’s plenty to see and do in Cesenatico. The coastal railway enables easy access to towns north and south. The hotel also lays on two or three days of guided walking tours inland, a day at Terme-Spa San Agnese, cooking courses with Mamma Luciana, Italian language courses, a trip to an outlet store for designer shoes, and as we are going in May, sunbeds on the beach. And of course no visit would be complete without a visit to Marco Pantani’s museum. 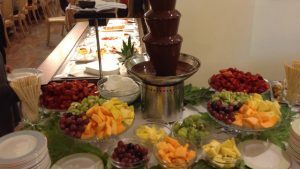 Accommodation cost per person for the seven days is €425 (Euros), half board, which includes breakfast, post-ride pasta and cakes and dinner, including wine. The cost is based on two sharing a room and there is a supplement of €40 Euros for single occupancy. This very reasonable rate also includes cycling guides, laundry for cycling clothing, roadside assistance and sunbeds on the beach. Rooms are also available in the Villa Riz next door for an added surcharge (If you are interested I have a list of the charges). Bike hire costs are €24 Euros for a carbon frame. Airport transfersto and from Hotel Riz are about €50 Euros return. Airfares which can vary depending on how early or late you book your flight. 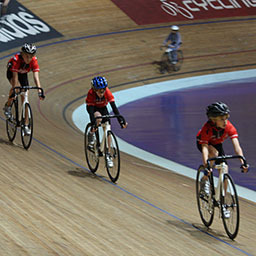 Regular trips to the UKs indoor velodromes are organised by the club. 2016 included day trips to the Olympic velodrome in Lea Valley and to the new velodrome in Derby. The highlight is an annual weekend trip to Southampton for two sessions on the thrilling 150m Calshot Velodrome. The weekend is intended for ALL members. Previous trips have been fantastic fun with a great mix of riders from young to not so young, and from beginner to those with a little bit of experience. Non-riders are also welcome to come along and support! This will be a fun weekend to experience the thrill of riding the velodrome! The velodrome is based at Calshot Activity Centre, Calshot Spit, Southampton and has a cafe with licensed bar serving drinks, snacks and meals all at reasonable prices! The Dawn Raid, usually held in the long days of summer, leaves Club HQ at the crack of dawn and makes a hundred mile round trip to the coast for a hearty breakfast. The Dawn Raid is our annual big ride to the coast, and this year the Raid will be heading South to the Lock Tearooms on the Blackwater Estuary near Maldon in Essex. Places are strictly limited and fill up quickly so email secretary@westsuffolkwheelers.org to book your place. First come, first served! 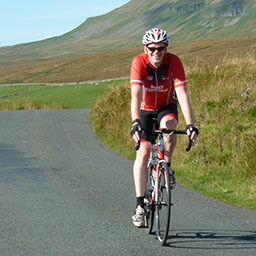 A weekend of riding in the beautiful Yorkshire Dales, with a group pub dinner on Saturday night and two guided routes through some of the best cycling country there is. Stay in the lovely market town of Skipton. Another beautiful route from Skipton, going via Littondale over into Ribblesdale and Elaine’s cafe in the tiny hamlet of Feizor. We head back via Settle and the well named High Hill Lane. Next year (2019) we’ll be returning to the newly expanded Dales Bike Centre, so to whet your appetite, take a look at this video! We’ll arrange transport between us and car pool where possible.